Nothing symbolized the Cold War more vividly than the infamous Berlin Wall that bisected Germany’s capital city. Constructed of concrete and barbed wire, it was a physical representation of the state tyranny employed by the Soviet Union’s “Iron Curtain” of Eastern Bloc nations aligned against the American-led forces of NATO. In 1987 when President Ronald Reagan stood before the wall and urged his Soviet counterpart Mikhail Gorbachev to “Tear down this wall!” the world cheered. In 1989 when the wall came tumbling down, the world cried tears of joy. Now, to commemorate the 30th anniversary of the Fall of the Berlin Wall, the prestigious Monnaie de Paris (The Paris Mint) has released a coin so stunning that you won’t believe your eyes. In fact, this legal-tender coin is crafted in such a unique way that it creates an optical illusion when you look at it! Struck in 22.2 grams of 90% fine silver, the approximately 48 x 35 mm L-shaped proof actually looks like a section of the wall complete with graffiti and barbed wire. When looking at the coin straight on, its unique shape and depth creates an illusion that it has been struck to stand up – just like a section of Berlin Wall! The coin’s obverse shows the famous Brandenburg Gate – one of the strongest symbols of Germany – while in the center a soldier holding a rose emerges from the wall in an allegorical representation for the end of the wall’s tyranny. Below the soldier the words 30 Jahre Mauefall (30 years of the Fallen Wall) have been inscribed. The coin’s reverse features inscriptions that mimic the graffiti that decorated the wall throughout its existence from 1961-1989. The words 30 ans de la Chute du Mur de Berlin 1989-2019 (30 years of the Fall of the Berlin Wall 1989-2019) are written along with the 10€ (10 Euros) denomination and “RF” for the Republic of France. Your 2019 France Fall of the Berlin Wall Silver Proof has been graded by the Numismatic Guaranty Corporation (NGC) as being in flawless Proof-70 Ultra Cameo (PF70UC) condition a distinction that means your perfectly-graded proof will have ZERO imperfections – showing all features and fields exactly as the engraver and mint intended. Just 3,000 of these unique and poignant silver coins have been struck for the entire world – that’s an incredibly small mintage for the millions of people who have been affected by the Berlin Wall. The Berlin Wall is gone – and so will the opportunity to own one of these coins if you don’t act fast. 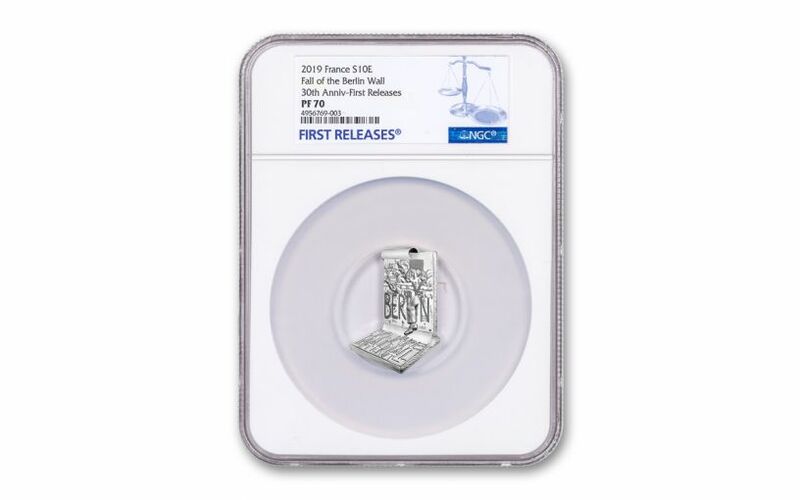 Add the 2019 France Fall of the Berlin Wall Silver Proof to your cart today! UNIQUE DESIGN COMMEMORATES FALL OF THE BERLIN WALL – This fascinating proof was released to commemorate the 30th anniversary of the Fall of the Berlin Wall. Its unique design creates an optical illusion that when one looks at it straight on it appears to have been struck to stand up on its end like a section of Berlin Wall. STRUCK IN GLEAMING SILVER – Each 2019 France Fall of the Berlin Wall Silver Proof was struck in 22.2 grams of 90% fine silver. LEGAL TENDER COINS – These 2019 France Fall of the Berlin Wall Silver Proofs are 10€ (10 Euros) legal tender in France and the rest of the European Union. GRADED IN PERFECT PROOF CONDITION – Your 2019 France Fall of the Berlin Wall Silver Proof has been graded by the Numismatic Guaranty Corporation (NGC) as being in flawless Proof-70 Ultra Cameo (PF70UC) condition. VERY LOW LIMITED EDITION – The worldwide edition limit for this coin has been set at just 3,000. A monument to Communist failure, the Berlin Wall stood grim and ominous for nearly three decades. 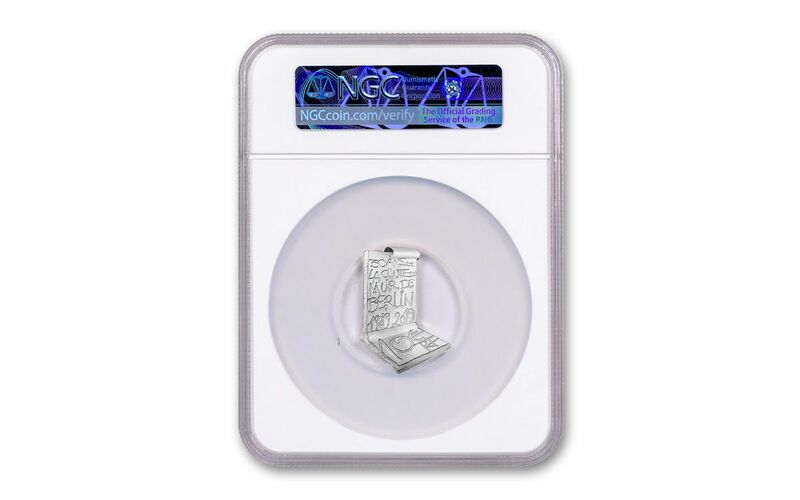 Now you can pay tribute to the 30th anniversary of the Fall of the Berlin Wall with this incredibly unique silver proof.